A month ago, EU Observer, an “independent online newspaper which values free thinking and plain speech“, published an article with a provocative title “Why is road safety not higher on EU agenda?“. Disregarding the somewhat sensationalistic title, the article draws attention to an important fact: While the union pledged in 2011 to halve traffic-related deaths by 2020, the reduction is not exactly going on any more. 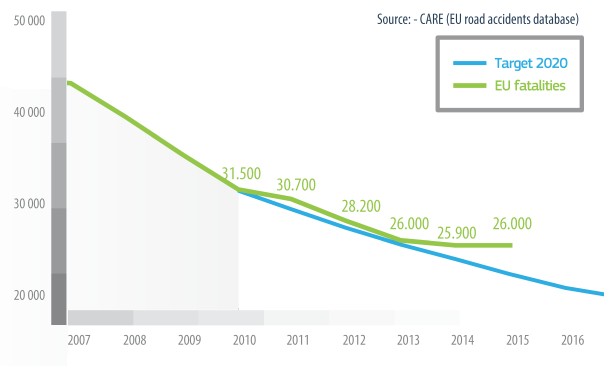 In the press releases “Road Safety: new statistics call for fresh efforts to save lives on EU roads” and “2015 road safety statistics: What is behind the figures?” the European Commission noted that its road are the safest in the world, but there has been no progress on this front since 2014 – two years in a row. The European Transport Safety Council seconded this with a press release of their own, “Urgent action needed on road safety as new figures show increase in deaths”. Diving into the wealth of charts accompanying the Commission’s press release, it is clear that the EU is divided between west and east in this regard, too. Should the eastern part somehow catch up, the targets would look far more reachable. Yet more alarming part of the statistics is that the vulnerable road users – pedestrians and bicyclists – saw hardly as much of improvement as vehicle occupants. Worth mentioning is that the statistics related to injuries have started being reported in a common format, which will enable better tracking of these injuries. The various sources mention several ways forward, including passing new legislative – increasing protection of vulnerable road users and revisiting the 2008/96/EC directive on infrastructure. The ETSC specifically calls out delays to a number of such changes as critical. Apart from these, cooperative ITS is mentioned, and Violeta Bulc, EU Commissioner for Transport, adds promotion of self-driving vehicles. At DataFromSky, we take safety seriously, especially that of vulnerable road users. We are steadily working towards making our services and products better to help understand road users’ interactions – not just for vehicular traffic, but others too. We too hope that technology can contribute to these efforts. We do not mean better cars, however. Better understanding of what happens on the road, using methods exploiting IT and otherwise austere with physical resources: that is what we hope for – and what we bet on, too. Why is road safety not higher on EU agenda? 2015 road safety statistics: What is behind the figures?